One of the first German rock bands, Birth Control originated from the German city of Cologne. Initially they were a heavy rock band, whose styling wasn’t unlike Vanilla Fudge or Deep Purple. Their self-titled debut album saw a US release and included a cover of a Doors tune, to further prove the point. The band released a few more albums before keyboardist Bernd "Zeus" Held and bassist Peter Foeller joined the core of drummer Bernd Noske and guitarist Bruno Frenzel on the uneven Rebirth in 1974. 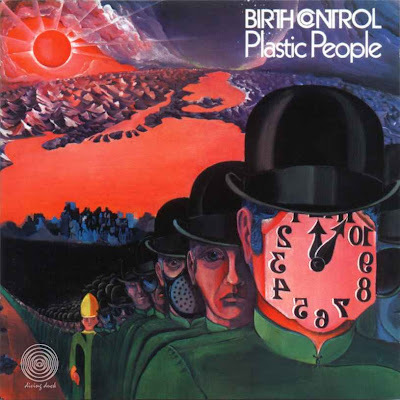 The band then turned to British Prog for their next album, Plastic People. But this was no cheap imitation; Held certainly was the catalyst, his keyboards providing a rich addition to the heavy Birth Control sound. Despite the added complexity, the opening "Plastic People" still rocked hard. Held’s command of the organ was first-class. "Tiny Flashlights" saw him switch to electric piano for its jazzier meter, while "My Mind" journeyed into Gentle Giant territory. "Rockin’ Rollin’ Roller" lived up to its title with Frenzel stepping up front. Drummer ‘Nossi’ Noske’s vocals were certainly good, but unfortunately not in the league of any of their British counterparts. Both "Trial Trip" and "This Song Is Just For You" harked back to their old sound, but the latter offered some fastidious string and brass arrangements. All in all, it was quite an original album and positive change in a "progressive" direction. Birth Control was one of the most popular live acts in Germany at the time and now had the invitation to visit the UK for the first time.